Whilst on their way to winning the Football Conference, Rushden & Diamonds reached the milestone of their 500th game. Brian Talbot celebrated his 4th Anniversary as manager of Diamonds with this win over Woking. It was his 218th game in charge and his 115th win. Diamonds previous nine games had seen them gain 23 points and moved them to the top of the Conference table on goal difference from Yeovil Town. Woking were mid-table, but they were also undefeated since Christmas. Diamonds dominated the game from the kick-off however, and a mixture of missed chances and some fine saves from Australian keeper Vince Matassa kept the game goalless at the half time break. 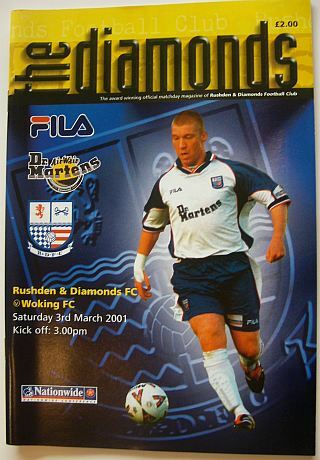 Within a minute of the restart, Diamonds went in front when Duane Darby’s shot from the edge of the area was deflected past the Woking keeper. Shaun Carey added a second on 65 minutes after Justin Jackson had crossed to the far post for Darby to knock the ball back in for the former Norwich midfielder to nod home his only goal for the club. Woking’s Jamie Pitman was sent off with 15 minutes remaining, but the score remained at 2-0 despite Diamonds finishing with figures of 12 corners, and 25 shots on goal. There was a big cheer when Mark Sale came on as a late substitute having spent eighteen months out of the game battling against cancer. The win extended Diamonds lead in the Conference table after Yeovil’s 1-1 draw at home to Stevenage Borough, although the Somerset side still had the advantage with two games in hand. The season was to finish on a high with Diamonds winning promotion, some six points ahead of Yeovil Town. Team: Billy Turley, Tarkan Mustafa, Gary Setchell, Shaun Carey, Mark Peters, Ray Warburton, Garry Butterworth, Jon Brady, Justin Jackson (Mark Sale 88), Duane Darby, Andy Burgess. Goals: Duane Darby 46 (1-0), Shaun Carey 65 (2-0).